Moor Lavender Calming Bath Essence soothes tension and eases the mind after a stressful day, instilling feelings of peace and tranquility. The lavender scent helps to calm both children and adults in preparation for a night’s sleep. 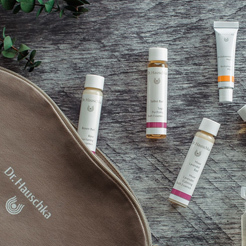 An integral part of the Dr. Hauschka Signature Cleansing protocol. Formulation: Lavender essential oil calms skin redness and sensitivity while imparting feelings of care and protection. Moor extract with almond and avocado oils protects and fortifies skin. Extracts of horse chestnut and horsetail support the health of the hair, skin and scalp. I love my Moor Lavender Calming Bath Essence. The smell and feel are soothing and relaxing. Very soothing and warming. I use after every bath or shower. Smells lovely and leaves skin feeling supple and protected, especially in winter. All lavender does not smell the same. This is the BEST by FAR of any lavender. Kripalu uses it in the Dr H Facials and I learned of it there. So I feel like I am getting spa treatment every morning when I use this with hot washcloths. My bestie introduced me to Dr. H years ago and it is my absolute favorite! I love to use the Lavender Bath in a bowl of water to soak my face with a warm washcloth! It is so calming to my sensitive skin, but also calms the soul! Love it! for the change in season come late this year. Time to put the Spruce bath essence away and onto my new fave. Excellent for a warming Winter bath. Perfect For Calming Stressed Out Parents and Energetic Toddlers! This Lavender Bath Essence is a must-have for all parents. Not only for themselves for a relaxing self-care, but also for their babes! I use one tsp in my child's bath and it is highly effective. It calms and prepares my child for sleep, and it's so gentle, with best natural ingredients that I don't have to worry about toxins. A win-win. Highly recommend! After a long day, this product is exactly what I need to calm and sooth my skin. The smell is not overpowering, which is ideal. Using this makes every day feel like a spa day. The lavender scent is refreshing and soothing- not overly floral or sweet. I love using it for baths, as well as part of my facial care regimen. Sometimes I"ll add just a dab to a warm washcloth while in the bath and rest over my eyes for added relaxation. Love to slip into the tub and smell the relaxing aromas and feel the silky soothing water in my skin. My skin feels soft and this winter is the first winter I don't have scaly skin in my legs! The lavender bath essence is one of my favorite products! It smells amazing! I put it in my son's bath and it doesn't irritate his skin at all. I even use it with my body lotion to add a little extra light scent because it smells that good! I have sensitive skin, and I use this for facial cleansing, either solo or with the cleansing cream. The product smells great and helps to soothe and moisturize my skin without an oily residue. Thank you for the gift of bath essence. Love it. Love the smell ( not overwhelming), softens my skin and doesn't leave an oil residue in the bathtub. This is a great product, but I rated it by giving only four stars because there is barely any leather; therefore, it requires quite an amount to clean the whole body. Smells exactly like lavender. I was given a sample of the Moor Lavender Calming Bath Essence from a Dr. Hauschka rep at a Whole Body store and it was just the clear formula -- almost completely the lavender oil suspended in something else. This formula contains other essences that dilute the lavender. I don't enjoy the scent as much and it does feel different on my face though I can't quite identify how. In addition when I took the cap off the bottle for the first time, what I believe to be the "stopper" with just a hole in the middle for regulating the flow of the product out of the bottle, was stuck in the cap. I haven't been able to get it out, which is annoying. I use this product solely as part of my facial cleansing regimen. It smells great and adds a bit of moisture and soothing elements to the water before and after cleansing. For lovers of the original Lavender Bath and the Moor Lavender Body Oil! This is the ultimate bathing experience. The scent is divine and helps to promote relaxation and sleep. Add 1-3 capfuls or as desired of the bath essence into the stream of running water as the bathtub fills. Shake well before using. Some separation or particles may be evident due to the natural botanical ingredients. This does not affect quality or effectiveness. As part of the Signature Cleansing protocol, add a small amount to a basin of warm water as a soothing facial rinse after cleansing. Bring a sense of tranquility to any room by adding a few drops to a bowl of warm water.